The monasteries are mostly situated on mountains or cliffs since many of the founders were hermits living in mountain caves, and the original communities grew up around them. Debre Libanos of Ham, for example, is on a narrow ledge in a sheer rock face where Abba Libanos used to meditate in the fifth century; monks and visitors climb down to it by the hand and foot holes which Libanos's disciples are said to have cut into the cliff. Debre Damo and Debre Salam are both reached by rope up a perpendicular wail of rock, and legends abound on how their founders made the first ascent. Some monasteries are at the bottom of a steep valley or ravine, such as Gunda-Gundet which takes five hours to reach from where it is first visible from above. Few are easily accessible. The center of the monks' life is prayer. The monks rise on most mornings at around four o'clock and assemble in the church to chant the morning office (Sa'atat) which last about two hours. On Sundays and major feast days they start the office at midnight and then perform the Mass (Kiddase), finishing at dawn. Unlike the large secular churches few monasteries have trained singers and the monks do not dance as the secular priests do. Some of the more ascetical monasteries do not even chant the office and the Mass, but prefer simply to say them. In mid-afternoon the monks gather once again, usually in the assembly hall, for a short office of about 15 minutes. Apart from these common prayers the monk is expected to pray frequently in private. Each monk is free to choose his own method of private prayer, though certain ways are common. Many retire to their huts every one or two hours and say the Lord's Prayer and the Canticle of St. Mary. Others repeat " Jesus Christ, please save me " or " Through Blessed Mary, have mercy on me " 41 times. Most monks also spend long hours at night in silent contemplation. The monasteries all own sufficient land for the monks, needs. Although manual work is not considered essential in the monk's life, as it is in the contemplative communities of Europe, the stricter monasteries such as Debre Libanos of Ham and Waldebba regard it as important that the members plough the land themselves. At harvest time all able-bodied monks and students are working in the fields, and only the old and lame remain behind. However in most monasteries a proportion of the land is rented to peasant farmers in return for a share of the crop. At Abba Gerema, where almost all the land is rented out, the monks explain that at the foundation of their monastery in the sixth century the Emperor dispossessed all the peasants living nearby to give their land to the monks; since the peasants then starved the monks in their mercy gave back the land in return for a third of the crop, an arrangement persisting to this day. The domestic work - cooking, cleaning, carrying water and the like - is mostly done by the students. Nevertheless some monks want a daily occupation and volunteer to do some particular chore: at Sequar, for example, two venerable monks have been the wood­cutters for the past half century and, as one of them said, death alone will make him lay down his axe. Almost all monasteries trade with the local people, and every week on market-day a group of monks go to the nearest town with mules carrying produce from the monastery lands. In exchange they buy soap and candles and any other small luxuries. Some monasteries purposely grow fruit and vegetables which they never eat themselves to sell at the market; at one community they even grow cha'at, a drug forbidden to Christians, for the local Muslim population, and they have become so proficient that their cha'at is reckoned the best in the province. Most monasteries, however, simply sell their surplus grain. Apart from the obligations of prayer and work, the monk is free to use his time as he thinks fit. The monks spend many of their leisure hours chatting with each other, and it is not uncommon to hear a heated discussion coming from one of the huts. On Sundays and feast days many visit nearby villages, and they are invited into the peasants' homes to drink barley beer (talla). Some go regularly to teach in the village schools: even today most children are educated by the clergy, and monks are usually preferred as teachers to secular priests. For spiritual guidance also people prefer to come to a monk since he can listen to their problems with detachment. Once a year on the feast of the founder the village people are invited to the monastery, and the monks entertain them with bread and beer. The Chief Monk Each monastery is entirely independent in administration, both of other monasteries and of the local bishop. The head of the monastery in all temporal matters is the Abbe Minet. He does not directly order the monks as the abbot in the West does, but he appoints three senior officers to govern each area of the community's life (see next section). In most monasteries the Abbe Minet makes these appointments alone, but in some he calls a meeting of all the monks to hear their views. For example at Enda Abuna Booroch after the harvest the monks meet to review the work of the previous year, and if necessary to advise on the replacement of senior officers. Sometimes an officer asks to be dismissed, and it is not uncommon for a newly-appointed officer to have disappeared by next morning. The main job of the Abbe Minet is not in the monastery at all, but is as ambassador to the outside world. He usually has a house in the nearest large town where he spends most of his time, dealing with disputes over monastic lands - in a country where the monasteries are major landowners the Abbe Minet can be no stranger to the law courts - and employing men to ensure that the tenants pay a fair share of the crop. He also has much influence in local church affairs. In Eritrea, for instance, the bishop calls a council one or two times a year of the Abbe Minets of the 18 major monasteries to discuss major decisions of policy in the diocese. The Abbe Minet's deputy is the Afe Memhir, and he has charge of the monastery when the Abbe Minet is away. The Afe Memhir keeps the general discipline of the community, and he has the authority to judge and to punish. Students who fight or who are insolent or disobedient, the Afr Memhir orders to be beaten, appointing a junior monk to administer the punishment. This happens quite frequently, and no shame attaches to the offending student. Monks, on the other hand, he rarely needs to punish, and it is considered a terrible disgrace. For such offences as persistent disobedience or physical violence the Afe Memhir sentences the monk to be put in the stocks: the offender's legs are put through two holes in a rough log, his feet are tied together, and he sits on a flat stone. For extreme crimes, particularly any kind of sexual immorality, the monk is expelled. As far as the ordinary monks and students are concerned, the most important officer is the Magabi. He governs the whole livelihood of the community and assigns each person to his task. He decides when the seed should be sown and the grain harvested, and he ensures that the food is distributed fairly each afternoon. He does not have his own hut, but generally sleeps in the granary to guard against thieves. Above the granary door at Enda Bona hangs a fading sign, supposedly inscribed 700 years ago by the monastery's founder, which reads: " No one may enter without the Magabi's permission." The Magabi's job is so hard that, although only young and able-bodied men are chosen, after two or throe years he usually retires and a replacement is found. The church and sacristy tire maintained by the Gabaz. Apart from students who clean the buildings, the Gabaz has under his direct charge an Ackabeit who guards the sacristy, sleeping there at night, and a bell-ringer who calls the monks to prayers. In large monasteries, such as Debre Bizen and Debre Libanos of Shoa, the Abbe Minet also appoints two or three older monks as advisers. They have no authority of their own, but they often accompany the Abbe Minet to meetings in town, and help to keep him informed of events within the monastery. Most monasteries, however, are sufficiently small and intimate to make such advisers unnecessary. The spiritual head of the monastery is the Komas. He is appointed by the bishop as his representative, and is often an older monk known for his exceptional sanctity. He does not guide the individual monk's inner life, as the Spiritual Director in the West does, but he gives advice when it is asked for, arbitrating in any conflicts in the community. As one monk described it: " While the Afe Memhir punishes by the rod, the Komas punishes by prayer." Large monasteries may have more than one Komas, and new bishops are appointed from the Komases. Most of those who profess as monks are graduates from the monastery school. The rest are widowers with no family ties; of these most are laymen with little or no education, though a few are secular priests or lay scholars. The intending monk firstly has a long interview with the Abbe Minet. The Abbe Minet does all he can to discourage him from his vocation, explaining the rigours of the monastery compared to life in the world. At the end of the interview the Abbe Minet asks: "Are you prepared to serve God as a monk, according to the ancient traditions governing the monk's conduct?" The candidate simply replies: " Yes, I am." Though it has long since disappeared in the West, the eremitical life is still widespread in Ethiopia. The cenobitical monks and indeed the ordinary people regard the hermitage as Man's highest abode on earth, and often monks seem fearful at the possibility of God calling them to it. In almost every monastery there are a number of monks - perhaps one tenth of the total-who confine themselves to their cells. They are described as " the monks who never see the sun." They have no responsibilities within the community and do not attend the daily common prayers. Food is brought to their huts each day by a single monk permanently designated to the task, and the hermit only emerges for the Mass in church on Sundays and feast days. Usually their cells are within the monastery compound, though sometimes they are a short distance away: at Debre Damo, for instance, hermits can be seen in apparently inaccessible caves in the sheer cliff beneath the monastery. Other monks or lay people can visit them (if they can reach their cell), and even today many of the rulers of Ethiopia, including the Emperor himself, frequently seek the advice of these hermits on both spiritual and temporal matters. Besides these monastic hermits, there are countless holy men (ba'atawi) living in remote forests and caves throughout Ethiopia. These men have totally rejected human contact, and if they ever visit a church they "come by night, crawling through the undergrowth so as not to be seen." as an admiring priest described it. They live only on the wild fruits and herbs which Nature provides. A few of these holy men are ordained monks who have left their communities, but mostly they are lay people - as another monk put it, " God has called them to holiness from nothing, as Christ called Peter and Paul." The Benedictine monastery of Europe, in the words of the founder, is" a school of perfection": the monk's daily life is a continuous lesson within a rigidly ordered institution, prescribed in detail in a written rule. By the same analogy the Ethiopian monastery is a university: each monk studies perfection in his own way within a loosely-knit community, governed by traditional rules and customs. 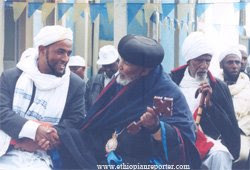 Ethiopian monasticism has retained the flexibility and freedom of the first desert convents of Egypt. The monk is within broad limits his own master, both spiritually and physically. He can participate in the community life as much or as little as he chooses, from being a hard worker who enjoys the company of his fellows in his leisure hours, to being a hermit. Zerfe Kebede is creating waves in Ethiopia with her new gospel songs. The 25-year-old Orthodox Church singer has enjoyed unprecedented success, breaking through to mainstream audiences. Her debut album, “Ruhama,” is a massive hit in Addis and other major towns. It was reported that 5,000 original CDs and 30,000 cassettes were sold in less than three weeks. The album is literally being heard everywhere, in taxis, cafés, and restaurants. Her smooth, warm, expressive voice seems to strike the right chords as praise keeps on coming from the media. Unusual for a church singer, she has become a cover girl in many secular magazines. The album’s 12 tracks, written by well-known names like Begashew Desalegn, Tizitaw Samuel, and Gashaye Melaku, contains messages of love, hope and worship, God’s grace, salvation, affirmation and similar themes. The lyrics are strongly influenced by the Bible, particularly the Old Testament and other books like Taemere Eyesus. Described as an uplifting and rousing work, the album blends traditional Orthodox Church vocal style and contemporary vocal styles, giving her music a richness and vitality that make the popularity of her album understandable. Zerfe first came to attention singing decidedly secular songs. She grew up in Asab until the age of 13 and moved to Dessie with her parents when Ehio-Eritria war broke out. By her own admissions, she wasn’t a church going girl and only recalls singing and listening to music constantly during her childhood. As she grew into her teens, music remained at the center of her life. When Zerfe was 16, she was discovered by the Amhara Region Music Squad. “They put me in test with other competitors; I stood first from the all of Woldia zone and Wollo,” she recalls. There, she started practicing scales and vocalizing to develop her ranges. In 2000, she joined the Police Music Squad in Bahr Dar and quickly started playing music with a band. Her big break came when she got a chance to perform with musical giants like Tilahun Gessesse, Mahamoud Ahmed and Bisatat Seyoum in a bazaar organized by the Amahra region in Bahr Dar town. After watching her play live, Bistaet was so impressed that she asked her to work in her night club in Addis. That excited and thrilled Zerfe. She came to Addis and started working at Bestaets’ night club where she started to build up a loyal fan base. She was performing the recordings of the established singers, like Aster Aweke, Hamalmal Abate, Fikire Addis Neka Tibeb. She later managed to get a weekly gig at Crown and Global hotels. An occasion took her to Tanzania with Abate Mekuria studio. Months later, she found herself in Dubai performing in hotels known as Sandris Inn and later in Ejiman Holiday Beach, where she has been making more lucrative gigs. Today though Zerfe is thrilled to be singing about her Lord, often dresed in white netela,swaying to the pulsing beat of gospel music.She has been doing that since the past four years, giving up the world and committing herself to God. She told Royal magazine that, ‘I think God for finding me worthy to carry these messages. I’m elated I’m able to do this at this stage.” The songs bear witness to her own personal salvation.One talks about a soul searching wanderer in the desert of sin. Whatever the case, the public affection for her doesn’t seem to wane. The following is a reader's comment posted under the picture-news "Ethiopian Muslims Demonstrate in DC". We wanted to put to our readers' attention in case you may overlook. Shame, shame, shame! Shame on you, you Islamists! How could you! Ethiopia is the last place on earth to be accused of intolerance, not by the likes of you, not by anyone on this planet. Is there any other faith on this world that speaks of in an irreverent or impious manner, by blaspheming the Almighty God, mocking sacred Christian teachings, than Islam? Isn't Islam telling the world for ages that our Lord Jesus Christ is not God but a mere Prophet, and that he has not died on the Cross? Isn't Islam teaching everybody that Christians are liars who have corrupted their Bible? Is there something more harmful, despicable and contemptible for Christians than this claim by Islam? Have you ever seen Christians protesting, not to mention killing, because of these words which are presented in a hateful and offending manner in the Quran? You might believe that Jesus existed, but you don't believe He is the Son of God risen from the dead; the devil also believes that Jesus existed. Do you think that the devil is going to be in paradise because he believes in Jesus? John 2:22 — Who is the liar? It is the man who denies that Jesus is the Christ. Such a man is the antichrist — he denies the Father and the Son. Many million Ethiopian Christians were murdered by Muslims during the Ahmed Grange invasion. Muslims had collaborated with the fascist Italians to wage genocide against million Ethiopian Christians, against Christian fathers and mothers, you were capable of destroying many of their churches and books. Have you acknowledged that and apologized for this shameful barbaric act? No, you haven't, because you still are filled with hatred and antipathy towards Christian Ethiopia, and you will never sleep until you have seen this great nation destroyed. Last week, Osama Bin-Laden has called Somalis to massacre Ethiopian infidels. Did you say something against it? Of course, not! Because that's your ultimate goal. Did you protest against him? No! Because he is your brother, and you're taught from birth that you must support and fund your cleric and his causes. But, have you ever seen a Christian threatening to kill such preachers of hatred? No! There are only two Kingdoms: The one is the kingdom of God on earth, namely, the true Church of Jesus Christ; and those who desire from their heart to be united with it...The other is the kingdom of Satan...those who refuse to obey the divine and eternal law, and who have many aims of their own in contempt of God, and many aims also against God. We will protect our sacred identity and heritage, country and nationhood by our divine spiritual power. There is absolutely nothing you could do against it. Ethiopians are very patient and quite, but the good ones will ultimately create a tsunami of public outrage. And I swear to Amlak that some of you will never set down your feet on the holy land of Ethiopia. I promise that to you! An exhibition in Venice sheds light on a Church that is almost unknown in the rest of the world, and yet is numerous and flourishing, with extremely ancient origins and strong Jewish traits. ROMA (Chiesa) - On the eve of Benedict XVI's trip to Cameroon and Angola, in Italy for the first time a major exhibition has been opened on another region of Christian Africa, Ethiopia, with icons, illustrated manuscripts, crosses, sculptures, paintings of evocative beauty, never before shown to the public. The title of the exhibition is: "Nigra sum sed formosa," I am dark but lovely. These words from the Song of Songs are traditionally seen in reference to the queen of Sheba, the progenitor of Ethiopia in the national epic poem "Kebra Negast," the glory of kings.In the poem, which in part coincides with the biblical book of Kings, the queen of Sheba visits King Solomon in Jerusalem, and conceives a child with him. With her, Judaism set down roots in Ethiopia. But the queen of Sheba also has a prominent place in Christian art and tradition. It is told how during her visit to Jerusalem, seized by prophetic intuition, she knelt in front of the wood of the bridge in the pool of Siloam, the wood destined one day to become the cross of Jesus. The exhibition is being hosted in Venice, the city that especially in the 15th century had a close relationship with that faraway African kingdom.This nation and its Christianity are still remote today. Most people are unaware of them. Ethiopia is one of the very few countries in the world in which not even a traveling pope like John Paul II ever set foot.The exhibition therefore marks an end of isolation. Finally, attention is turning to this astonishing Christianity on African soil. The isolation of Christian Egypt was reinforced by the expansion of Islam, which surrounded the kingdom and repeatedly tried to conquer it, but was always pushed back by a tenacious resistance.The greatest danger came in the 16th century. Ethiopia asked for help from Portugal, which sent an armada and defeated the Muslims. At that time, an attempt was also made to bring the Orthodox Church of Ethiopia back into union with the Church of Rome. St. Ignatius of Loyola worked on it personally. Jesuit missionaries arrived in two waves. At the beginning of the 1700's, Ethiopian kings embraced Catholicism. But immediately afterward, this attempt at union foundered. "At the moment, we have more than 50,000 churches in the entire country. Our young people go to Mass regularly, with participation of about 70 percent; overall, therefore, considering the regularity with which the adult and elderly age groups attend the liturgy, we reach 80 percent participation at Mass each Sunday. But there is another aspect that I would like to highlight, and that is monastic life: more and more young people are asking to become monks. We have 1,200 monasteries in the whole country, and about 50,000 monks and nuns. Overall, we can say that we have 45 million faithful if we consider the many Ethiopian Christians living abroad, to whom we have dedicated 17 archbishops. Inside the country, there are 45 bishops. In short, we are very proud of our history and our presence." To this it can be added that the clergy, who are extremely numerous, are for the most part married, but only before they are ordained, while the bishops are chosen from among the celibate monks. In the rural areas, the priests work as farmers, and are viewed favorably by the population. Many widowers and widows also retire to the the monasteries, groups of huts where an austere and penitential life is lived. The formation of the clergy is mostly limited to liturgical arts. The language of the sacred texts and rituals is ancient Ge'ez, but today Amharic is also used, the language of an ethnicity in the highlands north of the Blue Nile, the cradle of Ethiopian civilization. The churches have a unique structure. The altar is inside a closed space called "the holy of holies," where only the priests (and, in the past, the kings) can enter. Around it is a circular area for the deacons and cantors, who belong to a lay confraternity. Then there is a space for the ordinary faithful, many of whom follow the ceremony outside of the church not only because of the crowd, but also because they are catechumens or penitents. Ethiopian Christians always wear around their necks a cord called a "mateb," which they receive with baptism. Boys are circumcised eight days after birth, and presented at church forty days later, just as Jesus was. They enter church barefoot, as God ordered Moses from the burning bush. They do not eat unclean foods, such as pork, as prescribed by Leviticus. They claim to have the Ark of the Covenant and the Tablets of the Law, entrusted to them by King Solomon. In other words, they have preserved some features of Judaism. Almsgiving and help for the poor are widely practiced.The same is true of fasting from meat and dairy products, which is observed about 180 days per year. There are frequent pilgrimages to shrines, especially in Axum, the historical and religious capital, and to Lalibelà, with its ten churches carved into the rock in the 12th century, symbolically representing the topography of Jerusalem. The calendar is of twelve months with thirtty days each, plus a thirteenth month of five days, or, every four years, six days. The leap year is called the year of Luke, while the other three years take their names from the other three evangelists, in the order John, Matthew, and Mark. The rhythm of life is heavily influenced by the liturgical seasons. Christmas corresponds to January 7 for us. Lent lasts seven weeks, and each Sunday takes its name from its respective gospel passage: of the Sabbath, of the Temple, of the Paralytic, of the Mount of Olives, of the Good Servant, of Nicodemus. Ethiopian sacred art also has original features. And all it takes to enjoy its extraordinary beauty is to go to Venice, to the magnificent exhibition "Nigra sum sed formosa". The much awaited March 20/2009 demonstration by the Ethiopian Muslims was staged infront of the Ethiopian Embassy in Washington DC. 200 demonstrators came to the embassy to ask for justice about the Orthodox Christians whom they alleged insult Islam and Muhammed. The delegates reported talking to ambassador Samuel Assefa and staff in delivering their plea to the premier. The Babylonian MOON-GOD is located in the British Museum, Babylonian Room, Case B. 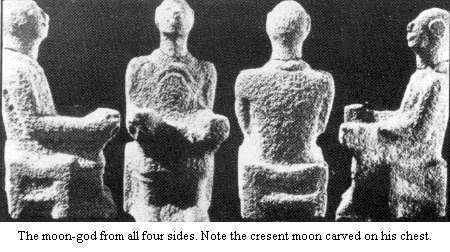 It is a humanoid form seated on a throne having a crescent moon in front of the moon god's head. Have you ever wondered why the crescent Moon is the symbol of Islam? Why do Muslims put a crescent Moon on top of their mosques and minarets? Why do flags of Islamic nations have the crescent Moon? Why do Muslims put a crescent Moon on their caps? The picture of the Babylonian Moon-God found on a cylinder seal in the British Museum is from an archeological discovery from the Middle East, which is now on display at the British Museum. Throughout the Fertile Crescent from Egypt to Turkey, archeologists have dug up hundreds of little idols with a crescent Moon sitting on their head. In ancient pagan temples, there are walls with pictures of a god sitting on a throne with a crescent Moon over his head. At times there are several stars placed near the Moon to symbolize the daughters of the Moon god. By this time, you are beginning to realize that there must be a connection between the ancient pagan religion of the worship of the god and Islam. And you are correct. Before Mohammed (if he ever really existed) was ever born, the Arabs worshipped 360 pagan gods housed in the Kabah in Mecca. One of the pagan gods they worshipped was the Moon god who was married to the Sun goddess. The stars were their children. People worshipped the Moon god by bowing in prayer toward Mecca several times a day. They would make a pilgrimage to Mecca and run around a pagan stone temple called the Kabah seven times; slit the throat of a sheep; and throw stones at the devil. They gave alms to the poor in honor of the Moon god. They fasted during the month, which began with the appearance of the crescent Moon in the sky and closed when the crescent Moon reappeared. They put the symbol of the crescent Moon on the walls of their homes and on their clothing. This Moon religion was the pagan religion in which Mohammed was reared. "Wait a second", you may be saying to yourself, "the ancient religious rituals of the Moon are what the Muslims are still practicing today! The Muslims bow in prayer toward Mecca. They make a pilgrimage to Mecca and run around the Kabah seven times. They are still slitting the throats of sheep and throwing stones at the devil. They even have the fast of Ramadan, which begins and ends with the crescent Moon. If this is true, then what we today call the "pillars of Islam" is nothing more than the pagan rituals of the Moon god!!" Archeologists have discovered that the name of the Moon god in Arabia was "Al-ilah" which was later shortened to "Allah." His consort was the Sun goddess and their daughters wer called "the daughters of Allah." The names of the "daughters of Allah" as given in the Qur`an are Lat, Uzza and Manat (Surah 53:19-20). They are the stars next to the symbol of the Moon. The mystery is now solved. Where did Islam get the crescent Mon symbol which sits on top of its mosques and is displayed on its flags? From the religion of the Moon god. Where did Islam get the name of its god? From the Moon god, Allah. How sad it is to see people ignorantly bowing down toward Mecca and praying toward the Moon god Allah. Muslims are actually worshipping demons according to the Bible (I Cor. 10:20). How different is the religion of the Patriarchs, prophets, apostles and Jesus. They did not worship the Moon god Allah or practice any of its rituals. This is why Islam and its god Allah are never mentioned in the Bible. There is but one, true, living, eternal, triune Being who is God by nature and Maker of heaven and earth. The name of this one true God is the Father, the Son and the Holy Spirit (Matt. 28:20); not Allah!! The Ethiopian government seems unblocking its ban on websites and blogs designated as government critic. Well, the government's ban on all blogspot.com related blogs will also be lifted, in turn, Deje Selam will also be accessible there. Deje Selam has confirmed from its sources that actually Ethiopia related websites are free now. EMF (01 March 2009) Reliable sources in Addis Ababa have informed EMF this week that all pro-democracy websites and blogs suddenly made access to internet users. 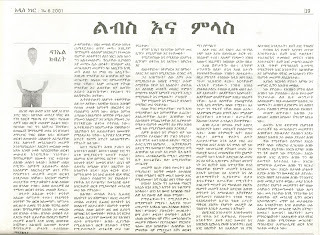 The websites had been unblocked shortly after the US state department released its 2008 Human Rights Reports, condemning the regime’s blocking Web sites, including the sites of the OLF, ONLF, Ginbot 7, and several news blogs and sites run by opposition Diaspora groups, such as the Ethiopian Review, CyberEthiopia.com, Quatero Amharic Magazine and the Ethiopian Media Forum. Media watchdog, Reporters without Borders complained several times that the government was censoring sites deemed critical of the government. The New York based Committee to Protect Journalists (CPJ) stated that its servers were inaccessible to users, and that emails were not coming through to CPJ. The Meles Zenawi regime was denying being involved in blocking the sites. Reliable source from the Ethiopian Telecommunications Corporation (ETC), the state-run monopoly telecom and Internet provider, told EMF that the Zenawi’s administration is using the Chinese expertises to block the sites and jam opposition shortwave Radios. “By doing so the regime is spending the country’s hard earned, multi-million, foreign currency which is supposed to be used for the development purposes.” The source said. Ethiopia, China and Zimbabwe are the three most named countries in the world which experience blocking internet access to sites.